July 1, 2014, The search is over.. It is one of those days when you wake up and think it was all a bad dream, it didn't really happen. And then you realize that the nightmare is real. Years ago a young man named Nachshon Waxman was taken hostage. He too was hitchhiking, he too only wanted to get home and see his family. He too was an American immigrant, he too had waited nearly two thousand years to return home to Israel. In the year 70 our holy temple was destroyed and Jews became scattered. From Spain to Holland, to England, to Jamaica, to Brazil, to America, from one country to another the Jew wandered, just seeking a place that would tolerate his existence. Kings and rulers came and went and the fortune of the Jew came and went with the whims of each ruler. Until...until we came home. But home did not bring peace as those who had settled in the land during our absence would not tolerate us. Today young people "claim the land" and claim their independence by fulfilling the Biblical promise of "To you I have given this land". They see the land of Israel as theirs to travel, and they travel everywhere. It is their birthright. I still recall the moment, years ago, when my late father woke me up in the middle of the night with the words, "They killed him!" His voice was full of pain, I can still hear it. It was the pain of losing a family member. He had been up all night listening to the radio, he could not sleep. Such was my father, a man who so loved his people. 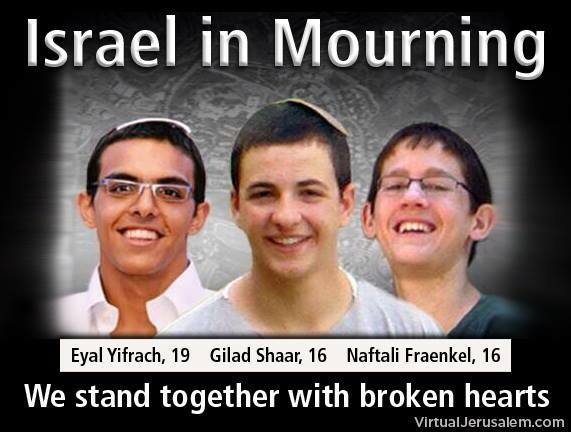 Nachshon Waxman was taken hostage and all of Israel was on edge, glued to the news, praying. And then he was dead. For the past 18 days, again, all of Israel was united in worry. Rumors spread, speculations, commentary. And last night, almost a personal recreation of the past. My mother calls me. She is on an outing with her group of volunteer teachers. My mother works as a volunteer for the school system, teaching English. Last night was their evening; a visit to the Tomb of Mother Rachel, a happy festive dinner. She called me, "They are dead! they are all dead!" "No, no, no, it can't be". I didn't want to hear it, I didn't want to believe it. I turned on the news. They reported that the army is searching near Halful but no word about bodies. I called my mother back, perhaps she was mistaken, perhaps...it was all a mistake. Perhaps there is still hope. "No", she said, her sources were reliable, it will be announced soon. Soon darkness descended upon all of Israel when the radio announcer said...It is now allowed to be publicized, the bodies of the three young men were found. They had been dead all along, shot at once. Their beautiful voices silenced for ever, three young lives over and our people and our friends all over the world cry out in one voice Ribono shell Olom, Ad Matai?!? Master of the universe, How long? How long shall the Jewish people suffer? When will the tribe of Abraham be allowed to reside with the other children of this earth? The radio turns to discussion, and anger, as everyone has ideas and criticism. The political left says this is proof that we need to leave this area and give full control to the Arabs, give them a state with an army. (sounds logical...) The Right says it is time to destroy the enemy. Others say we must weigh our moves carefully and not act in haste. Someone suggests the problem can be solved by sponsoring more bus rides and transportation for students in this area. But one message comes out clear to all sides: No matter how many police or military we have we cannot protect every inch of the land, we cannot provide a personal body guard for each civilian. No matter how many police or military we have we cannot protect every inch of the land, we cannot provide a personal body guard for each civilian. What we can do is learn from mistakes. The boys were duped. I am sure all the details will come out soon. They entered a car and quickly realized they were taken captive. They had thought they lucked out, some kind people offering them a ride home. It was late, they just wanted to get home, they wanted to celebrate the Sabbath with their families. As soon as the emergency phone call was made there were shots. The situation will be analyzed and opinions will come forth. For my part all I can say is we must continue training and teaching Krav Maga. This is our answer, this is what we can do. We are left with empty hearts but we must get up and move forward. The dead can do no more but we can. We can devote ourselves to training, to finding solutions. This past week our Krav Maga classes here in Israel have been devoted to fighting off knife attacks and attempted hijackings. We are doing what we can. But we need more instructors, in Israel and around the world. What can we do? We here at IKI feel we can offer a simple and effective method of self defense, one that can work for everyone, one devoid of ego, of complexity or memorization. In Israel our policy has always been that no one is ever turned away for lack of money. This is about lives. This is about making a contribution, making a difference. For our sake and for theirs, we must do something.